Mr. Antonio Patrón Marmolejo, the manager of the ibis Bilbao Barakaldo hotel, welcomes you. The ibis Bilbao Barakaldo hotel is 7.5 miles (12 km) from the historic center of Bilbao and 6.2 miles (10 km) from the Guggenheim Museum. All the rooms at this wonderful hotel are comfortable and fully equipped with air conditioning, heating, television, WIFI and hair dryer. Our hotel also has a restaurant, 24-hour bar and free car park for guests. You also have the option to bring small dogs. Stay with us and enjoy the ibis experience! We look forward to welcoming you. Bilbao is an incredibly varied city with lots of activities, such as: visiting the Guggenheim museum or historic center, sports such as surfing or walking routes along the Camino de Santiago and enjoying Basque cuisine, including pintxos. The ibis Bilbao Barakaldo is 7.5 mi from the historic center of Bilbao, 6.2 mi from the Guggenheim museum and 11.8 mi from the airport. Located in Barakaldo, the most populous region of Bilbao, a stone's throw from the estuary and ideal for walking. Play sports, relax on the beach, go on gastronomic adventures, enjoy Basque culture and the modern art on display in its museums... Could this city be any more perfect? Look no further - book your room at the ibis Barakaldo hotel now! ENJOY THE BEST LA LIGA AND CHAMPIONS LEAGUE MATCHES IN OUR BAR AND RESTAURANT. We were very happy with our stay at the ibis. Good welcome at reception, comfortable bed and lovely walk in shower. Breakfast buffet was adequate, but could have been better if things weren't so scattered about, juice from machine and jug on counter! Coffee machine stopped working, ran out of water and drip tray was full, feel this should have been done before a busy breakfast session. Hotel is in good situation for shops, port and tourism. Not much we can say. We arrived went to bed and left first thing in the morning. The breakfast could be improved. As always, IBIS in Spain provides a comfortable stay with great staff and very comfortable beds. Barakaldo has a very nice and spacious restaurant area. Parking is excellent too, and free. Great room, great breakfast, good experience. Estimado Hilario, Le agradecemos el tiempo que se ha tomado para hacernos llegar los comentarios sobre su estancia en ibis Bilbao Barakaldo. Sentimos enormemente que su experiencia no haya alcanzado sus expectativas; por favor permítanos hacerle llegar nuestras mas sinceras disculpas. 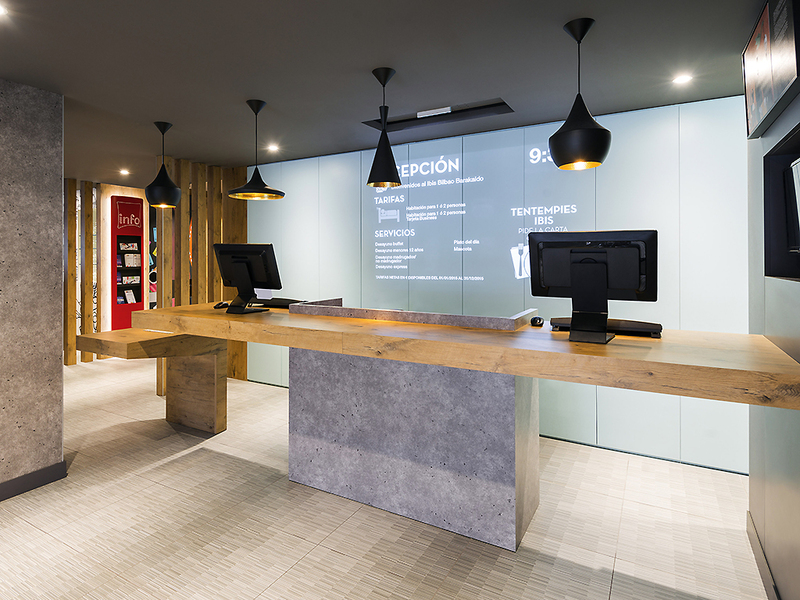 En Ibis, nos esforzamos en proporcionar un servicio de calidad a cada uno de nuestros clientes, por ello sus comentarios son muy importantes para nosotros. Apreciamos sinceramente que haya compartido con nosotros este asunto y confiamos en que nos dé una nueva oportunidad para poder ofrecerle un servicio óptimo. Reciba un cordial saludo. The stuff were lovely and very helpful. Room nice and clean, staff were very professional and polite excellent service. The only thing that could have made the stay better would be to have coffee making facilities in each room. We had a great time in ibis Barakaldo. All the staff was extremely nice, helpfull and friendly. We felt really comfortable and welcome. Will stay here again next time we visit Bilbao, and we will also recommend to our friends. Keep up with the good work! We love Ibis Hotels, really comfy beds, always really clean, really nice friendly staff and best of all we can take our dog. Everything you want from a reasonably priced hotel. The room was impeccably clean and so was the bathroom. The bed was very comfortable and, the bedding felt and smelt like new. The staff were friendly, efficient and unobtrusive. The breakfast is very good value with a great range of different types of food. I cannot find fault with my experience at this hotel. The reception and staff were very friendly and helpful. The room clean and the bed up to Accord standards. Food fairly basic but what was required after a long drive. Car park full so car parked on street. Great location for catching the ferry. Welcoming and pleasant, helpful staff. Very comfortable clean room. Good choice on menu for dinner . Convenient for Bilbao port only 10 minute drive. Definitely would use again and highly recommend.